This series, supported by the Volvo Research and Educational Foundations, discusses walking and cycling in cities with a special focus on low- and middle-income countries. In 2015, 447 pedestrians were killed from traffic-related incidents in Nairobi, Kenya’s capital of more than 3 million people. Amidst cars and minibuses (“matatus”), pedestrians are forced onto the street when sidewalks end or are missing or damaged. Poor markings, signage and traffic management make crossing the road a gamble with death. One young girl who was hit by a car described vehicles as “traffic monsters” haunting her daily walk to school. Nairobi, like many other cities, has invested heavily in car-centric development, building highways and expanding road networks. Little attention to the safety of other road users has led to high crash rates and dangerous streets. Promoting combinations of more public transit, cycling and walking is helping some cities not only become safer but reducing congestion, obesity, pollution and climate change. In 2017, Nairobi took the first steps to redress this problem, passing the Non-Motorized Transport Policy for Nairobi. The new policy puts the city on the path toward more inclusive design, but it still has some way to go. Nairobi’s historic focus on roads stands in contrast to how people actually get around the city; just 12 percent of households own a private vehicle and most people use public transit. Pedestrians and cyclists must be courageous. One 2013 study found that in a 3-month period in 2011, 59 percent of all road traffic injuries in the city were pedestrians; another 5 percent were cyclists. There are growing cycling clubs, despite the danger, and a major ride once a month. 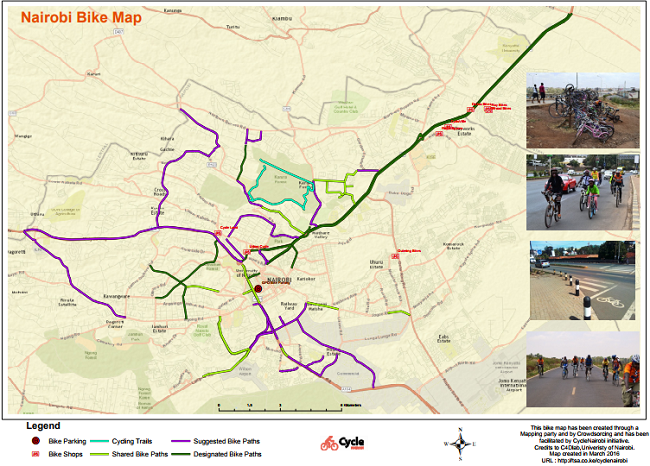 Around a third of Nairobi adults would consider cycling if there were safe, segregated lanes, according to a 2015 survey. A crowd-sourced map of cycling lanes shows that a nascent network already exists and a few new links could create the beginnings of a city-wide system. Design problems lie behind much of the city’s road safety problems. Nairobi’s footbridges, used by cyclists and pedestrians alike, are a prominent example. The bridges that cross over busy roads are so poorly designed that many people simply avoid them because they’re inconvenient, instead trying to cross at street level, leading to crashes and congestion. 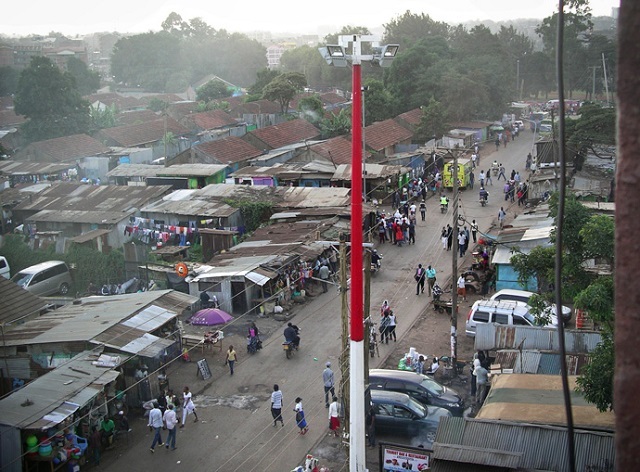 A recent study showed many pedestrians in Nairobi are struck within 500 meters – or a 15-minute walk – of a footbridge. While there is much to be done to make Nairobi a safer, more pleasant place to get around, the Non-Motorized Transport Policy is an important first step. The policy calls walking the dominant mode of transport in the city and aims to build a framework and set of interventions to prioritize pedestrians. These include developing a new street design manual with complete streets principles, mandating at least 20 percent of the transport budget goes toward supporting non-motorized modes, stronger regulations on developers to provide foot pathways, traffic-calming measures, and rules to discourage the blocking of non-motorized networks, like sidewalks and cycling paths. Future steps to strengthen this policy could include well-designed non-motorized infrastructure being required for every road, rail and bus project. This would be a city-shaping rule given how much Nairobi is expected to invest in infrastructure in the years ahead. Audits could be done to ensure that new infrastructure is built to certain standards and linked to existing modes of public transit as well as walking and cycling networks. Most critically, support should also be given to non-motorized infrastructure that is not connected to roads. Nairobi has considerable green spaces and pedestrians and cyclists often feel safer when they are segregated completely from road traffic. Linking the city’s green areas through walking and cycling paths could have multiple boons, helping to preserve ecologically important areas, reducing congestion on roads and improving the health of residents. 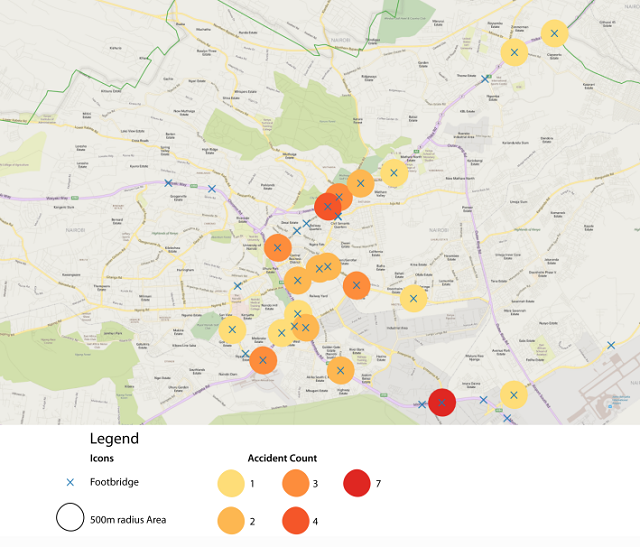 The development of a street design manual, required by the new policy but not completed, is the first practical step the government – a new government, now – faces in achieving the vision of a safer, greener, more connected Nairobi. Currently, the Ministry of Transport, Infrastructure, Housing and Urban Development has no proper urban road standards and guidelines. Engineers in the ministry are asking for these guidelines so that no road is built with problematic and incomplete sidewalks or cycling paths as an afterthought. The United Nations Environment Programme has developed helpful guidelines – piloted in Nairobi, where the agency is based – that should be used in this effort. Additionally, the City of Nairobi officially endorsed global guidelines for urban street design developed by the National Association of Transportation City Officials in the United States, which include non-motorized transport and could be adapted for local conditions. The Non-Motorized Transport Policy for Nairobi offers an important way forward for the city, but much work remains to push for implementation of the strategy, especially with a new government in charge. However, it is encouraging to see growing civic engagement around walking and cycling in the city. Additionally, parts of the Central Business District have already been pedestrianized through earlier efforts, showing what can be done when the city works with citizens and businesses to transform for the better, creating a more walkable, active and enjoyable place for all. Jacqueline M. Klopp is an Associate Research Scholar at the Center for Sustainable Urban Development at the Earth Institute, Columbia University. She works with the University of Nairobi and Kenya Alliance of Resident Associations on non-motorized transport issues in the city.